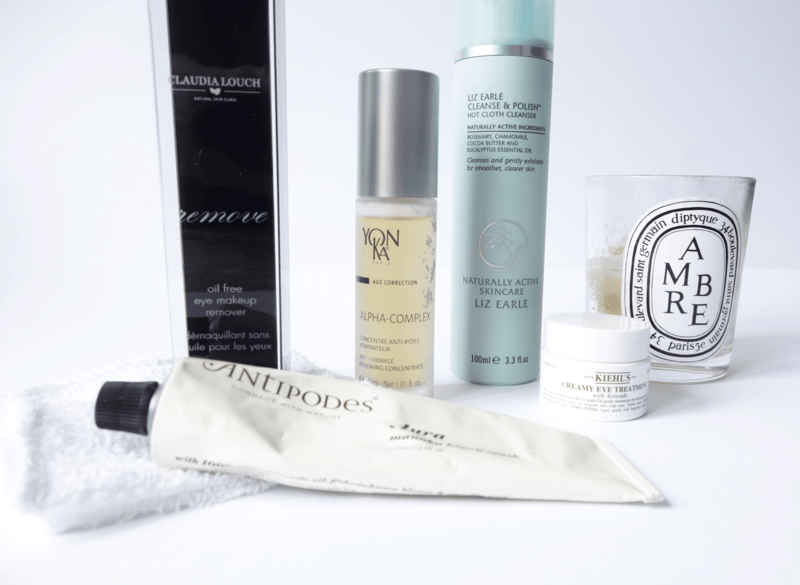 The mid-week pamper has been in full force recently, as I’ve been trying to focus on targeting skincare issues (mostly uneven skin/dullness) when it comes to my treatments. I’ve got a nice little routine going so thought I’d share what I’ve been using as a treat during the week. Starting with a cleanser, I take any stubborn makeup off with the Claudia Louch Oil Free Makeup Remover. It has a lovely silky texture and the packaging is really chic. It removes makeup well and leaves skin feeling refreshed and without a film, like some other removers leave. Afterwards, I go over my whole face with the cult classic Liz Earle Cleanse and Polish. I always have a bottle of this stashed away, as you literally can’t go wrong with it. It’s gorgeously creamy, removes any leftover makeup and makes skin soft and smooth. I always notice my skin is more radiant when I use this too. A pamper session isn’t complete without a mask, so recently I’ve fallen back in love with Antipodes Aura Manuka Honey Mask. It’s such a great all in one product, as it hydrates, helps blemishes and really sorts out your skin. It’s one I reach for when my skin is acting up! After I’ve washed it off (you can leave it on overnight as a treatment if you want though! ), I apply a few dots of the Kiehl’s Avocado Eye Cream, which is a great basic eye cream which hydrates the area so well. As for a treatment, a new one I’ve been trying out is the Yon-Ka Alpha-Complex. It’s a really concentrated fruit enzyme overnight peel and I swear this stuff works miracles! I’ve used a lot of exfoliators, but this one really tops them all as I’ve never had such smooth skin when using anything else. The best thing is that the effects last a good two weeks, so it’ll definitely become a staple in my routine from now on. What products have you been using this week? Oh and enter my £250+ giveaway too!